Should your Shopify store be using Facebook’s newest ad type? Canvas is an immersive and expressive experience on Facebook for businesses to tell their stories and showcase their products. 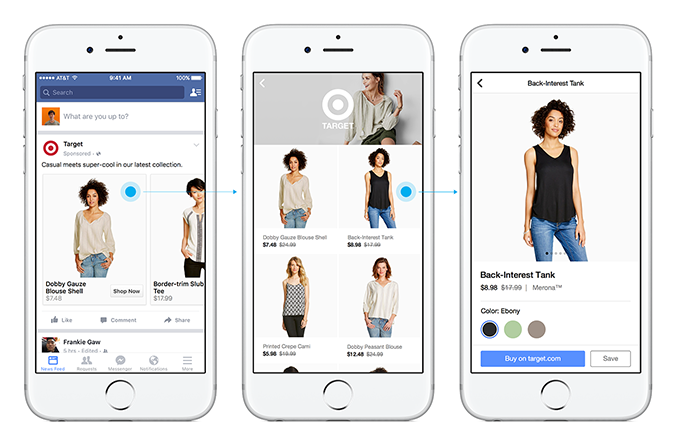 With Canvas ads, Facebook has made it excruciatingly easy for you to showcase your products and share your brand’s story on their mobile app- using ads that look and feel native. Forget lengthy loading times to external websites that often aren’t optimized for mobile. Instead, advertisers now have creative autonomy when sharing content via this new distribution channel. Canvas loads quickly, as much as 10 times faster than the standard mobile web. Facebook says the early tests of Canvas have shown that users actually want to stick around and be engaged. 53% of users that open a Canvas view at least half of it, and the average view time is a stunning 31 seconds. The top Canvas ads can see more than 70 seconds of view time per user. How are businesses using Canvas? From promoting new products to sharing a unique brand stories, businesses large and small alike are clambering to create an enticing Canvas ad. Although Canvas ads are still relatively young, here are Shoelace’s top picks from notable brands that are already utilizing the new tool. Are Canvas Ads Only For Large Brands? Of course not! Canvas ads aren’t reserved for the Coca-Cola’s and Target’s of the world with war chests of marketing dollars. You can launch an effective Canvas ad campaign within the hour. Want to give Canvas ads a try for your business, but scared to dive into the unknown? Here are some of Shoelace’s best practices, so you can launch your own Canvas success. What does this have to do with Canvas ads, you might ask? Since Canvas is only available via mobile, users who choose to visit your website through viewing a Canvas ad will also be browsing your site on their mobile device. If your store is not optimized for mobile commerce, your visitors who were so entranced by your beautiful Canvas will be in for a sore disappointment. Ensure that your store operates seamlessly on mobile to maximize the potential of Canvas ads. Canvas ads take up the entire mobile screen- use this prime real-estate for attractive visuals that will engage viewers at first glance. In this example for one of our customers, we used a carousel to display the various products the store offers. Introducing a destination URL to the individual carousel pictures allows you to drive users to specific sections of your site. Canvas ads let you insert your product catalog to create a scrollable display featuring any product set of your choice. If you are an e-commerce business, this should be a focal point of your canvas. By doing this, you are creating a bite sized version of your website within Facebook that takes a fraction of the time to load. Each product is automatically linked to its respective product page. The leg work is done from within Facebook; your site is just the final piece of the puzzle. With Canvas ads, you can help engage mobile users in a new and exciting way. It is simple, effective and beautiful. Consider them for your next advertising campaign and reap the rewards. How Do You Make a Canvas Ad? Note: The name of your Canvas will not appear to people viewing the ad or post. It’s just for your own reference and to differentiate it from your other Canvases. It works like the name of a file. 6. Click the “next arrow” to Select a theme and pick which type of background you want your Canvas to have. Still have questions? Find us at Shoelace and we’ll be happy to help you on your Canvas journey!